Perfect Loophole is one of our infamous 'Three Amigos' here at Peaceful Prairie Ranch. 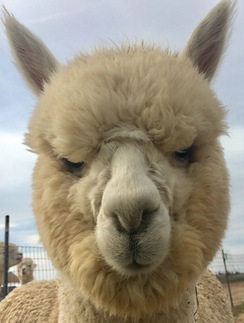 He is named after our dear AZ senator's 'alpaca debacle of 2017' and is here to show the world (and that Arizona Senator) that alpacas are much more than a tax loophole! Just follow this guy and see what he does! He is bringing the same extreme Mean Curve and density with softness to the game in the same fashion that his brother before him, Hummingherd's Bodhi did. Bodhi has already won numerous show awards, with most noted being Best Crimp at Colorado's ABR 2016 Fall Show. If mean curve, lasting fineness and density are needed in your program, these are the fellas to watch. Perfect Loophole's dam is Hummingherd's Perfectly Delightful, a cross of Hummigherd's Delight (one of the densest females you'll find) and Snowmass Perfection. We feel so fortunate to have gotten this female from the elite Hummingherd breeding program. She is now becoming known as one of our best foundation females here at PPR. This young male will surely be an up and coming future herdsire as well! Regardless, you can be assured through both parental lines that you have a long term, lasting fineness and exquisite white fleece producer with good fleece weights. Loophole will be attending shows starting late 2017 - please come meet him if you're at GCC in Calif. October 2017. We have many males, all related so this may be a great opportunity to twist our arms and purchase an up and coming male herdsire at this very reasonable cost. Price is subject to increase at any time.